This is a simple thing to do to add some wonderful flavor to many different dishes. Roasted peppers are great in salads, mixed in lima bean hummus, added to salsa, on pizza and burgers, and so many other things. The technique I use is simple. Preheat the oven to 375 degrees. Wash the peppers and cut them in half, then clean the seeds and pith out of the middle. Rub the skins with oil or fat (I used olive oil) and place them skin side up on a baking sheet. Bake for about 30-40 minutes, until the peppers are soft. I like it when the skins get a little burned or charred. When they are cool enough, remove the skins. 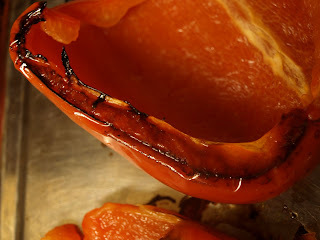 If using smaller peppers such as Anaheim, reduce the cooking time. Peppers, particularly hot chili peppers, are also very good roasted over a fire or roasted in the broiler for a similar effect. Hold them near the fire until their skins blacken, then cover them or put them in a bag for 10 minutes, which will cause the skins to come off more easily. Be careful with hot peppers- roasting them in any fashion can release the capsaicin (what makes them hot) into the air which can irritate your eyes and nose.